Workshops, podcasts, open forums, networking, plus performances! DANCE MASSIVE is an exciting bi-annual festival that began in 2009. It is an initiative of Arts House, Dancehouse and Malthouse Theatre in partnership with Ausdance Victoria. Through the collaboration of these four arts organisations, DANCE MASSIVE exists via pooling of resources promoting and celebrating Contemporary dance in Australia. Since 2009, it has presented 71 Australian contemporary dance works to audience numbers of over 40,000! This year, in its fifth incarnation, DANCE MASSIVE ran from the 14-26th March and brought to Melbourne a collection of work from Australian emerging and established choreographers and companies. This festival not only presents work for audiences but creates an encompassing festival for dance audiences and artists alike – including workshops for festival goers and industry professionals, a live free open conversation series with invited professionals, a podcast series where the choreographers interview each other, a scribe service where audiences can have their experience documented anonymously, as well as opportunities for choreographers to present new work and meet producers and delegates from around Australia and internationally. Like previous years, DANCE MASSIVE 2017 did not disappoint. Australians have much to offer and we are lucky we have a festival where we can truly sink our teeth into contemporary dance and feel assured that the future is coming and we are a part of it. I saw three shows many shows as a DanceLife representative. Noise Quartet Meditation by Lilian Steiner is a work exploring the relationship and perpetual exchange between tranquillity and chaos. 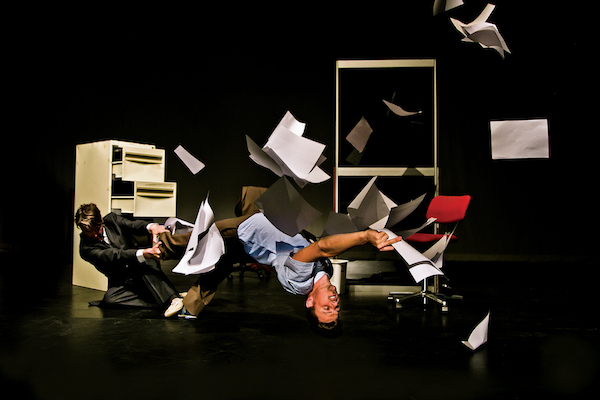 Originally performed in the 2014 Melbourne Fringe Festival, Noise Quartet Meditation won the 2015 Green Room Award for Concept and Realisation and the Shirley McKechnie Award for Choreography. Performed by Steiner, Briarna Longville, Jonnine Nokes and Atticus Bastow (Nokes and Bastow also create/created the Sound Design) with Lighting Design by Matthew Adey. It begins before the audience enter and the echo of what has occurred lingers long after the audience leaves. We are offered a beginning respite with calm; there is time to sink into to it. Two pairs face each other, there is an exchange, Nokes and Bastow move to their drums, Steiner and Longville begin to move in a loop of considered movement that circles within their bodies and in the space. It is meditative. As time progresses, this meditation journeys us to places of noisy disorder aurally, visually and kinetically. This work gives the audience a chance to swim in a state/space where we become aware of the calmness that exists within noisy chaotic surroundings and the chaos that lives within the quiet. The dance between these two places washes over us and without any obvious effort cleverly includes us. Steiner having been nominated in 2013, 2016 and 2017 for a Green Room Award for Best Female Dancer performs exceptionally as does her collaborator Longville. The alchemy and heightened sensitivity created by the performers causes a vibrational push/pull of energy through the space. I could have stayed sitting quietly enjoying the pulsation of what was left behind for a very long time. Deepspace by James Batchelor, performed by Batchelor and Chloe Chignell with Lighting Design by Rose Connors Dance, Sound Design by Morgan Hickinbotham and Visual Art by Annalise Rees was performed in The Stables at the Meat Market in North Melbourne. Deepspace is a response to a two-month expedition Batchelor undertook in the Southern Ocean in early 2016 with 60 other scientists, students, artists and the ship’s crew. They travelled on Australia’s Marine National Facility research vessel, the Investigator, to study active volcanos near Heard and McDonald Islands. We entered through two white box spaces before settling in the third space where the performance takes place. The first with delicate sculptures hanging from the ceiling, the second with a small detailed drawing of the sea attached to the wall and the third where we find the performers waiting for us. Through this process we were able step further away from the city and into a quieter space allowing for our own journey to take place. Batchelor and Chignell begin tumbling through space on their feet. We were immediately given a sense of the ever-moving waves of the sea and drawn further in to the experience. They wore long black pants and long sleeved black tops giving the impression that they as individual people were less important than the experience they wanted to create via their bodies. In his program notes Batchelor talks about the challenges and inspiration this unique experience presented him with and it is clear within this piece that it was a profound experience. Many ideas were presented in this work, some employing objects or artwork and I could have stayed with and enjoyed many images for much longer. However, there was a sense of calm, stillness and open space conveyed throughout which I imagine must have existed in the isolated environment Batchelor experienced. At one point Batchelor and Chignell rest large white pieces of board on top of themselves moving them slowly. It becomes mesmerising to watch. I imagine they are big pieces of ice being carried and supported by the sea. The sound scape included the low humming sounds of being inside a ship at times and at others a more cinematic/epic score, which I thought was suitable for the magnitude of nature. The ending was a beautiful surprise and not something I wish to clumsily describe with words. In this final moment, I felt how small we all are as human beings, and that we are in fact part of something far more magnificent and far more amazing than we often take the time to acknowledge. Cockfight by The Farm was also presented at the Meat Market in the cobblestone Pavilion. It was Co-Directed by Kate Harman, Julien Louis, Joshua Thompson and Gavin Webber, with Sound Design by Luke Smiles, Lighting Design by Mark Howett and Set Design by Joey Ruigrok van der Werven and Thompson. Webber and Thompson first met as teacher and student and have since worked together for over ten years. Cockfight is a navigation of their changing relationship which uses an office as an interactive and recognisable landscape. Webber and Thompson both have a reputation as highly skilled, very physical artists and Cockfight’s movement language and physicality did not disappoint. Their working relationship is one clearly built on trust and respect which comes through in their ability to discover and carry out highly original and inventive partnering which often has an element of risk involved. The work begins with a series of vignettes as we are invited into this theatrical world. A sequence of one-up-man-ships and manipulations unfold and we are taken into a world of power plays which we can all recognise. Cockfight seamlessly included text and movement and an exceptional use of the set where it became part of the show and was not just a forgotten background. In the Cockfight program notes, The Farm explains that they prefer not to label and be labelled. I wonder if this is as much to do with keeping their own creative possibilities open as it is to do with creating a space for the audience to experience whatever it is that arises for them without minimising it under a banner of what should unfold both on the stage and inside their minds and bodies. At times, it was laugh out loud funny and at others quietly touching. I watched and was reminded of our need to prove ourselves as valid, the challenge required of us to accept change, the value of sharing knowledge across generations/experience and the compassion we feel for one another – because if we haven’t already been ‘there’ in our younger years, we know it’s where we are headed soon enough. Chimene Steele-Prior is a Melbourne based Dancer, Choreographer and Teacher. Unable to contain all her energy as a six year old, she was sent to ballet class and thus a life-long love affair began. She trained at the New Zealand School of Dance (Diploma of Dance Performance) and the Western Australian Academy of Performing Arts (Bachelor or Performing Arts (DANCE)). Chimene has worked as an independent dancer throughout Australia and performed regularly with Opera Australia since 2011. She has been the recipient of numerous choreographic residencies and her last full-length work was nominated for a Green Room Award in 2015.